Success Principles: Don't Quit Until You Made It - Motivate Amaze Be GREAT: The Motivation and Inspiration for Self-Improvement you need! Let's say you are a truly driven person. You have your dreams, and you're not just dreaming about it. You have a list of goals, you write them down in your daily journal. Not only you plan for things to happen but you also are making things happening: you are in the process, doing and getting results from it. Contrary to your expectation, the results you're getting are not what you've wished for. Something is missing, something is wrong. • You've schedule long, medium and short term goals. • You're being precise, really pointing them out. • You are not talking about it, you are doing them. • But when you don't get what you, you simply quit. Quitting a goal, it's starting from scratch, you've got all the work, and at the end you just quit. All work is wasted. That's a bad move and that's why you're not achieving what you want! It could seem a little confusing, but achieving goals and failing at achieving them should be hand to hand. They have a direct relationship. Use the relationship metaphor for a better understanding: when you and your mate have an argument, you don't end the relationship right? You work on problems and solve them, and in no time you're back with each other like you used to. Why? Because after all, you still love each other, and quitting it's no possible scenario. Your love is stronger than anything else. It gets stronger and stronger after each argument, because you get to know each other really well, with time you know what to do and what not to do with your mate. Your goals should be that way to! Stronger than any failure. Even though you've failed at achieving them you still love what you're doing, and you don't quit at first adversity. You manage to solve the problems/obstacles and you try again harder and smarter. 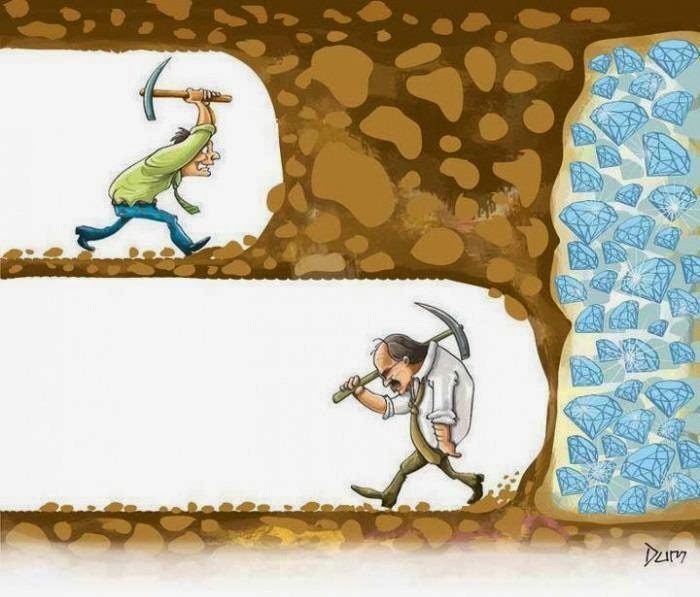 In fact, you shouldn't quit no matter how many obstacles come at your way, including failure. - For some failure is pain, a pain stronger than your goals - this will bring you fear, and you'll be afraid of trying again. The result will be quitting your goals - That's a bad sight you should avoid it. - For others failure is experience, experience that will strengthen your ability to perform the tasks needed to achieve your goal - this will bring you self-confidence. The result is: your goal will become stronger - A good sight you should look for it. The difference between the two it's the meaning you give to failure, it's on you to decide the outlook of your feelings, don't get it twisted. So failing or experience (!) are friends of achieving if you given them the correct meaning. What's missing in your journey to succeeding it's the persistence needed to stick with goals no matter how much times you fail. You only have to solve two problems: how to get what you want, and when to give up what you want. Don't leave them until you've solved both. A - Get what you want - achieve your goals!!! B- Give up what you want - only when you have achieved it!!! All the rest is BS. In other words, don't quit your goals until you made it. You've gained experience? Try harder, smarter and stronger! You've gain experience again? Try again, harder, smarter and stronger! You've gained experience again and again? Try again and again, harder smarter and stronger!! Don't quit until you've achieved it!